Great is your Gratefulness | Half Heart. Whole Life. So we’ve recently wrapped up the time of year where thankfulness is really something that’s front-and-center in most people’s lives. There’s Thanksgiving, there’s Christmas, there’s the celebration of a new year…all great opportunities to reflect, and – of course – I encourage that. Lately, though, I’ve been thinking a lot on the subject of being thankful…actually I’ve been thinking more about being grateful. “Bruh, you cray-cray, they’re the same thing!” you might be thinking…but hear me out here. To me, there’s a difference. You see, to be thankful can often mean there’s someone to give that thanks and someone to receive it. You read this crazy madness I call a blog, and I say thanks. And I mean it. Being grateful, to me, is just a little bit different…it’s deeper…it’s almost like a state of being. You choose to BE grateful…and even if there’s no one around to admit it to, you can still be grateful and it can still be amazing. 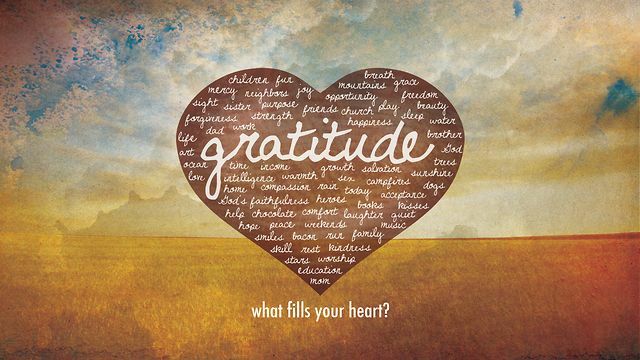 And being in a state of gratitude encourages you to give thanks. See? They’re connected. What does gratitude look like for me? It looks like those things that have a deeply-rooted connection within me, and are often influenced by my personal experiences. Take breathing, for example: we breathe without once thinking about it. But I look at pictures of Nolan when he was on a ventilator and it stirs up this feeling deep within me: I need to understand the intricacy of this thing we call breathing and realize that I take it for granted. And when I put it in those terms I can be overwhelmed by feeling that I’m SO very fortunate to breathe without machinery. Or think about the very reason you and I are on this blog: the human heart. Before you became a heart parent, did you ever stop once to think about the function of a human heart? Some of you, maybe, but for most of us as long as we wake up the next day it’s all good, cuz the ol’ ticker is working just fine. Now? You are all about that heart, aren’t you? If you’re like me, you think about your own much more than you used to. But man, the heart is an amaaaaazing machine, yet there it lives in our chest without a second thought from us. My heart works pretty well so far…and that’s an awesome thing because we’ve seen how bad it gets when it doesn’t. And the gratitude list goes on and on: a place to live, freedom, clean drinking water, time with my family, etc. I think true gratitude lives in the deep necessities of life. So why on earth am I talking about gratitude? Because existing in a state of gratitude is really important! Here’s a good one for all the heart parents out there. Being grateful reduces depression and increases happiness. Personally I think a lot of this stems from the perspective given from being grateful. Once you realize what it takes for your heart to beat or your lungs to breathe, you realize that others don’t have it so easy…and therefore while your current situation might be challenging, you could potentially be far worse off. Empathy is one lesson I think everyone living on this planet needs to learn. Period. You may not live through what someone else has been through, but that doesn’t mean you can’t put yourself in their shoes. And when you can do that, magic happens…and that’s how we make the world a better place. Now heart parents, we’ve been through some real nasty stuff, so there’s a tendency to have this “we’ve seen it, so we get it” attitude, but sometimes we can fall into more of a “we got through it, so you just get through it” attitude. And that, friends, is not empathy. I think we can all benefit from being more empathetic, and we grow that muscle through our gratitude. This is so crucial for us, isn’t it? We’ve all been at the end of our rope so many times, but having mental strength has kept us from totally going bonkers. But let’s be honest, guys, we could always use some more mental strength because we don’t know what CHDs – and life itself – will throw at us on any given day. Existing in gratitude will make our minds stronger. So guys I want to encourage everyone – myself included – to live more in a state of gratitude, because it’s a very powerful state of being. Yes, it’s good to be thankful too…but never forget to be grateful. Maybe you’ll keep a gratitude journal…honestly I keep telling myself to do that, but honestly the only practices I seem to do a good job of keeping are drinking coffee and looking up memes. But maybe this will be my year, who knows? The best thing about gratitude? It has all those benefits and costs you nothing. Now that’s the kinda infomercial I like. Stay grateful, friends. Posted on January 22, 2016, in thankfulness and tagged CHD, congenital heart defect, gratefulness, gratitude, HLHS, hypoplastic left heart syndrome. Bookmark the permalink. 1 Comment. This would be a great time to express my gratitude!!!! Thanks for this blog, the information,the insight, and for giving me a glimpse into what this grandmother has in store in the months to come. My HLHS grandson is due May 9th. My HLHS son died 36 years ago, 4 days after birth. Since, December 21st, I’ve gone back to the beginning of your blog and I’m reading every chance that I get. I’m overwhelmed with information and emotion but today I am grateful. Thank you from the bottom of my heart for sharing, from the bottom of your heart.